There is an unclosed literal string. Line 1, position 2097154. This error comes because of limitation set by default of 2MB for XML data. My data for that XML field was having approx 18MB. To open this big file, I have to change the SSMS configuration from Tools | Options. You can see that “Results to Grid” has option to retrieve maximum characters. 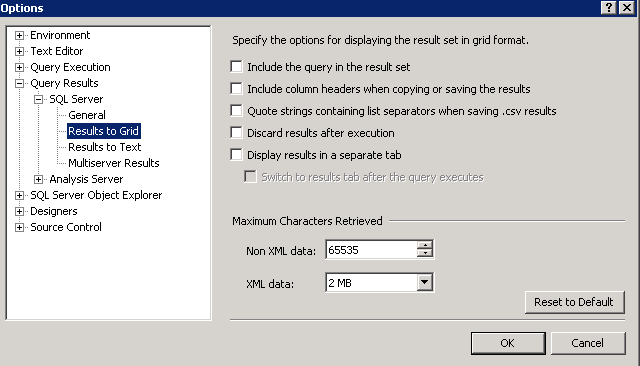 For “Non XML Data:”, it is 65535 and for XML data, it is 2MB. My data was around 18MB so obviously I can’t get it open in SSMS. I have changed (temporary) it to “Unlimited” for a while, clicked on “OK” button. Close my current query window and execute query again. I got my XML field in SSMS and when I have clicked on that field, I got my XML file open. 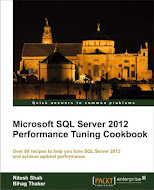 This entry was posted in XML and tagged error fix, xml on March 5, 2013 by Riteshshah.